As we approach the holiday season and the new year, it may be a good time to celebrate our past success, understand where we may need to improve, and commit to where we want to go in the future. Applying a “Year-in-Review Retrospective” can be a good way to do this. 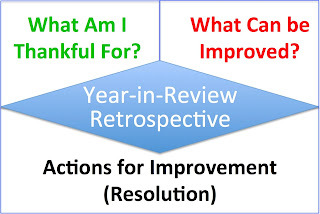 This type of Retrospective asks you to reflect on the year (e.g., 2014), embrace what you are thankful for, and help you build meaningful and realistic resolutions for the new year. 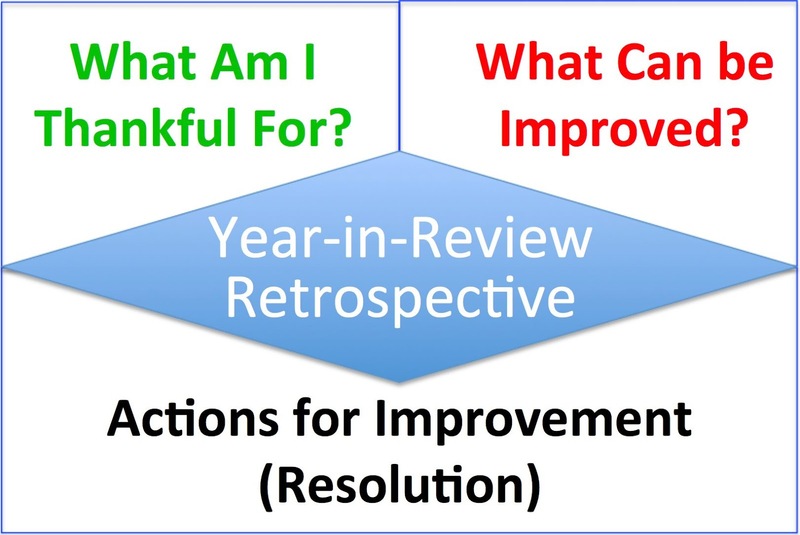 Let’s begin by establishing a framework for applying the retrospective. Let’s call this the Retrospective Starter Kit. We start with creating a reflection (or retrospective) board. This board should have a place to indicate “What I am Thankful for” (or “What we are Thankful for”), “What can be Improved”, and “Actions for Improvement”. Start with reflecting on what went well over the past year. Document the successes and events and then put them in an order of significances or importance. Then take a moment and celebrate what went well (maybe over a drink and with some music in the background). Next, reflect on what was problematic over the past year. Write each statement as a problem. Avoid jumping to solutions (that will come next). Once all problems are listed, prioritize which problems may be the most significant or challenging. Lastly, take the top 2 or 3 problems and consider actions for improvement. You want to identify the root cause for each problem so that you establish a solution that addresses the cause behind the problem. For example, if the problem is that “I am out of shape”, suggesting a solution of “I need to work out” may not be the only action. Instead, applying root case techniques may uncover that you need to create time in your schedule first. Otherwise simply saying that you should “work out” will be unrealistic. Once you have identified actions, then you must commit to your resolutions (or actions that you identified). Over time, if you find the retrospective valuable, you may want to conduct this practice in an increasingly timely manner, possibly every month. Within an Agile context, this occurs at the end of each iterative of work which could be weekly, bi-weekly, every three weeks, or four weeks. Agile Adoption Roadmap – this blog offers many helpful ways to implement and practice Agile to achieve an Agile mindset and receive the business benefits of being Agile. Being Agile: Your Roadmap to a Successful Adoption of Agile – in 24 concise chapters, this book focuses on the business benefits of Agile and then introduces you to the Ready, Implement, Coach, and Hone (RICH) deployment model as a pathway to help you in your Agile transformation. Happy Holiday and Celebrate, Reflect, and Improve!